A briefcase often signals that you are an organized person, and also indicates that you are in some manner a professional. Having a good quality briefcase when going to a business meeting or maybe job interview can strengthen your self esteem compared to carrying a flimsy textile bag (that has its uses too in another setting). In this review article we focus on leather briefcases only, because we believe they deserve a space of their own on our site. Leather of good quality is an outstanding material! Jump directly to the bag that interests you most by clicking on it in the Quick Navigation below, or keep on reading! Medium Classic Briefcase Saddleback Leather 14" W x 11" H x 9" D 6.6 lbs. 100 Years Limited 13"
Large Classic Briefcase Saddleback Leather 16" W x 12" H x 9" D 7.6 lbs. 100 Years Limited 15"
Extra Large Classic Briefcase Saddleback Leather 18" W x 13" H x 9" D 8 lbs. 100 Years Limited 17"
Medium Front Pocket Briefcase Sadleback Leather 15” W x 11 ½” H x 7 ¼” D 6.5 lbs. 100 Years Limited 15"
Large Front Pocket Briefcase Sadleback Leather 17” W x 12” H x 7” D 7.4 lbs. 100 Years Limited 17"
Medium Briefcase Thin Saddleback Leather 14 ¾” W x 11” H x 4 ½” D 5 lbs. 100 Years Limited 15"
Large Briefcase Thin Saddleback Leather 16 ¾” W x 12 ½” H x 4 ½” D 6 lbs. 100 Years Limited 17"
Medium Thin Front Pocket Briefcase Saddleback Leather 15” W x 11 ½” H x 3 ½” D 5.35 lbs. 100 Years Limited 15"
Large Thin Front Pocket Briefcase Saddleback Leather 17” W x 12” H x 3 ¼” D 5.75 lbs. 100 Years Limited 17"
Fossil Mercer Top-Zip Work Bag 15.5"L x 3"W x 11.25"H 2.75 100 Years Limited 14"
Bosca Soft Partners Brief 12" x 14.75" x 6.25" 3.35 lbs. Lifetime Limited 13"
Saddleback Leather Co has been around for 10+ years, and from the start they set out to make bags of premium quality, made from full grain leather (you can read about leather qualities here). Today they have a wide range of leather luggage, wallets, handbags, backpacks and even jewelry! Their warranty is second to none. For defects in material and craftmanship it is a breathtaking 100 years. Can you believe that? Their slogan is accordingly: "They'll fight over it when you're dead". To us that shows supreme confidence in the quality of their own products. At Travel Gear Depot we believe this is the best of the best when it comes to leather bags. They do cost a whole bunch of your hard earned money, but considering the longevity of them, they are actually cheap. Click HERE if you want to go directly to the Saddleback Leather site. 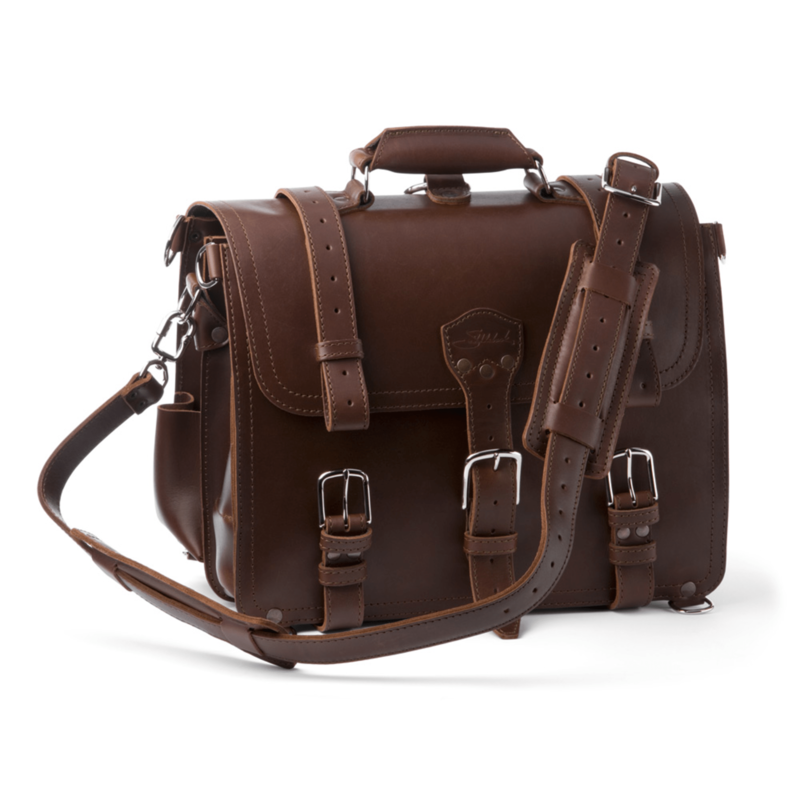 You can check out the briefcase at the Saddleback site here! So what is our take on this bag then? We have already praised the company and the overall quality of thier products. But what do customers actually think about the Classic Briefcase? Of the (when this is being typed) 378 reviews on the Saddleback site, 334 have rated it with 5 stars, and 31 with 4 stars. This means that there are 13 negative ones. What do they say? The most common complaint is the weight. We don't really know what to say about this, since the weight is stated in the description, so you know what you get when you order it. If you think it's too much, then of course this is not the bag for you. A couple of reviewers think the backpack mode with the straps sliding through a ring at the top doesn't work very well. On the other hand, another user (bicycle commuter) adores the backpack mode and praises the design features that makes it very comfortable. Do we recommend it then? Oh yes, very much so. It is an investment that cant go wrong. AND CLICK HERE TO CHECK OUT THE CLASSIC BRIEFCASE ON AMAZON! Of the 89 reviews on the Saddleback site there are no 1 or 2 stars, and 3 with 3 stars. One of these is not happy with the color, one is unhappy with the change to suede pig skin lining (which another user is very happy with) and how the leather is tanned. 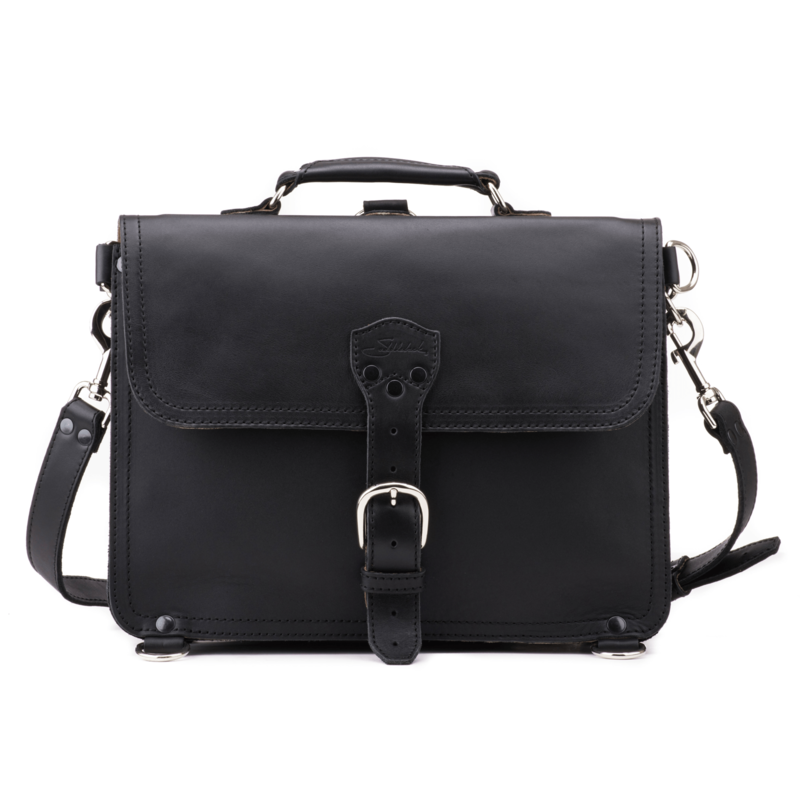 Like the Classic Briefcase (above) we wholeheartedly recommend this as well. Worth every penny. AND CLICK HERE TO CHECK OUT THE FRONTPOCKET BRIEFCASE ON AMAZON! You find the Thin Briefcase here at the Saddleback site! One of the 4 negative reviews (out of 102) is unhappy with the D-rings and the internal organization. These are features well accounted for in the description and images though. A couple of users think the strap is too long even in the shortest position. ​This could be easily fixed by adding a couple of more holes in the strap, and we hope that the Saddleback Co will do that. Meanwhile, you could ask a shoe mender to do it for you. Or maybe you can do it yourself. Also, when the strap is in its shortest position, there is a large amount of slack that the single loop will not hold. One more loop please Saddleback? To be honest, we don't have much to say. This bag has 53 reviews on the Saddleback site, and 47 of them are 5 star ratings. In one of the 2 reviews with 3 stars (there are none with 1 or 2 stars) the user stated that this bag was not for him/her, since during the workday as a teacher he/she had to carry it a lot and frequently needed access to papers, markers, erasers etc. It simply got tiresome to open and close the buckles. AND CLICK HERE TO CHECK OUT THE THIN FRONTPOCKET BRIEFCASE ON AMAZON! 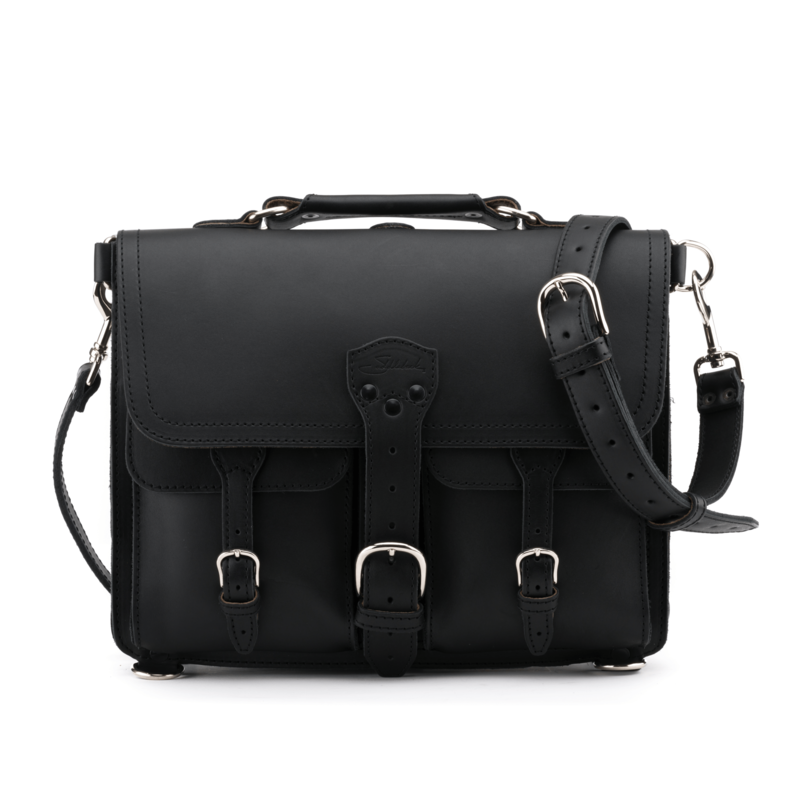 ​Compared to the Saddleback thin briefcase the Fossil Mercer is about 2 lbs lighter. Accounting for this is the thinner leather quality and the fabric lining. This is in most respects a good quality briefcase, or workbag. Most reviewers are happy with it, and the average rating at Amazon is 4.3, calculated on 25 reviews. A couple of users have spotted one "fatal flaw" with it though. The small tab holding the shoulder strap is not stitched to the side of the bag, but attached with glue. For one user it came off after using the bag for less than three months. We agree with the reviewer that this is a major flaw, since the possibility of using the shoulder strap vanishes if the tab separates from the bag. The warranty only covers a year, so if this happens outside of this year you are on your own. However, if you have the possibility to stitch the tab to the bag yourself, the bag is worth its price. And perhaps yo don't even want to use the shoulder strap? No time to read the whole review? Then please click here to go directly to Amazon for latest price and availability. Watch the video for a presentation of the Bosca Soft Partners Brief! You find the Soft Partners Brief here at Amazon! We have to be honest here. We have actually not found all that many reviews of this bag on the web.​ But, we have found quite a lot of its predecessor, the Bosca Partners Brief. Out of 42 reviews on an e-commerce site 98% recommend it, and the average rating is 4.5. So, since Bosca is a reputable and well established company known for their high quality leather goods we figure that the quality of the Soft Partners Brief is equal to the former bag. The few negative reviews we've seen (of the Partners Brief) has been about a buckle breaking (he got a new bag) and the leather on the handle starting to unglue after a year. This user just sewed it back, and lived on happily with the bag. We feel safe ​the recommending the Soft Partners Brief. We think it's a beautiful bag and from what we understand it's also durable. We only wish for one thing: a detachable shoulder strap. There is none. If that's a problem is up to you. Want to know about different types of leather? Read our article here!